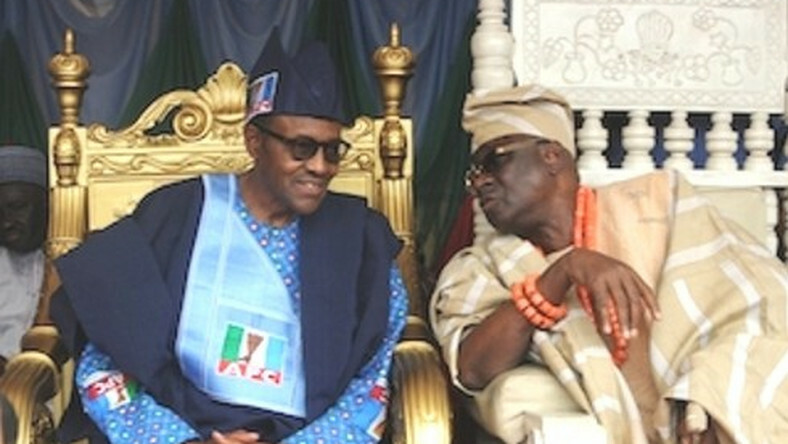 The Oba of Lagos, Riliwanu Akiolu said President Muhammadu Buhari is a man of his words and will be victorious in the forthcoming Presidential election. The traditional ruler, who noted that the body of traditional rulers in the state were happy to receive the Team, said that they appreciated Buhari’s efforts as a highly respected person in Nigeria. He said he had a catalogue of requests, including mass transit and pressing issues on the Apapa ports, and they had all been committed into writing. He commended the Minister of Works, Power and Housing, Babatunde Fashola on his hard work and efficiency for keeping contractors on their toes, saying that he has done creditably well. Earlier in his welcome address, Governor Akinwunmi Ambode said that the state was very delighted to receive the President and for all he had done for the state. ”It is my pleasure to welcome Mr President and Mr Vice President to the palace of the Oba of Lagos, who is the Chairman of the Council of Obas and Chiefs in Lagos. ”On behalf of all of them, we welcome you to Lagos in continuation of your Presidential campaign rally. “We are very delighted to receive you, we are very appreciative of everything that you have done for us in Lagos. In the team were the Vice President, Yemi Osinbajo, Governor Gboyega Oyetola of Osun, APC Chieftain, Bisi Akande, a Chieftain of APC, Bola Tinubu and others.